Make your kitchen pop with the functional and commercial VIGO Single-Handle Pull-Out Sprayer Kitchen Faucet in Stainless Steel. It includes a spray face that resists corrosion and tarnishing, and is easy for you to clean. The spout expands up to 30-inch and swivels 3600 for full sink coverage. The Glacier Bay Market Pull-Out Kitchen Faucet in Stainless Steel features an elegant, transitional style design that will compliment a variety kitchen dicor. Its single lever handle meets ADA standards for ease of use in adjusting water temperature and volume. The pull-out sprayer features an aerated spray and a new TurboSpray that is exclusive to Glacier Bay. The TurboSpray from Glacier Bay provides a stronger spray pattern than your standard pullout faucet. The sprayer also includes a 48 in braided hose for an extended reach, making it ideal for filling large pots and pans or washing down the sink. This kitchen faucet also includes the exclusive FastMount mounting system to make installation quicker and easier. Edison Single-Handle Pull-Down Sprayer Kitchen Faucet in Stainless Steel Make your kitchen pop with the functional and commercial VIGO Single-Handle Pull-Out Sprayer Kitchen Faucet in Stainless Steel. It includes a spray face that resists corrosion and tarnishing, and is easy for you to clean. The spout expands up to 30-inch and swivels 3600 for full sink coverage. Edison Single-Handle Pull-Down Sprayer Kitchen Faucet in Stainless Steel is rated 4.6 out of 5 by 1198. Rated 5 out of 5 by AmandaL from Looks Amazing!! I couldnt ask for a more complimentary piece for my kitchen! Does this faucet pull down just like a regular pull down faucet? 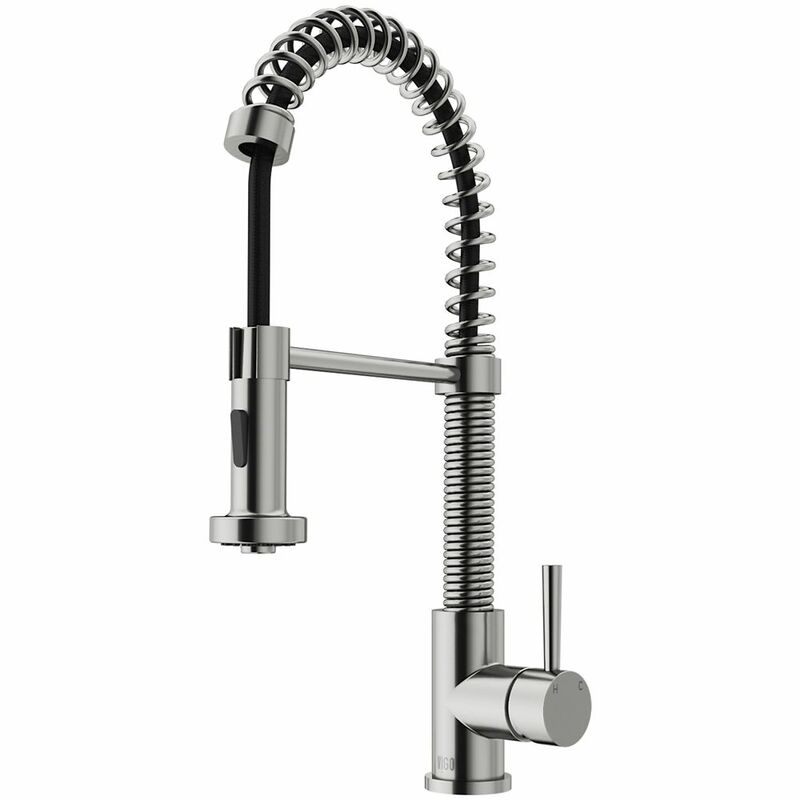 Noticed that some &quot;chef kitchen&quot; faucets like these do not have a true pull-down function and instead simply swivel or can be slightly pulled. Please note that this item is a regular pull down model and has the normal capability to extend more. Does this faucet come with an optional deckplate for installation? This item does not come with a deck plate. If you would like to purchase an item with a deck plate, SKU 1000798400 has a deck plate. Does this come with a faceplate? Is so, what size? Does this come with a deck plate?